Alexandra Boiger grew up in Munich, Germany as the youngest of seven children. She studied Graphic Design at the Fachhochschule Augsburg before working in Feature Animation at Warner Brothers and Dreamworks. After working in animation, Alexandra decided to pursue a lifelong dream of becoming a children’s book illustrator. 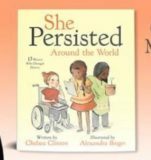 She has illustrated many picture books, including She Persisted: 13 American Women Who Changed the World. Max and Marla was her debut as both author and illustrator. Alexandra now lives in Northern California with her husband and daughter.